I’m sure most of you would be complaining about indigestion or bodily heat after all the nonstop feasting during the recent Chinese New Year celebration as I know quite many who were still down with acute throat related problem. There’s actually a beverage that you should take note of, if you were to be wildly feasting away anytime throughout the year. I did hint about the beverage I served to my guests every year which consisted of chrysanthemums, honeysuckles and licorice roots brewed with certain amount of water and sweetened with some sugar/honey but I guessed no one took it seriously. Well, here’s the living proof… I’m still free from all the throat related sickness. Haha! Anyway, another related feasting problem, especially for those image conscious people, would be the amount of fatty food they had consumed during this festive season. There’s also a remedy to that but you have to be aware that you have to regulate the amount taken per week as the fruits by the name of Chinese hawthorn berries, Crataegus pinnatifida (Shan Zha – 山楂) are believed to be regularly used in TCM (Traditional Chinese Medicine) for digestion of meat and fatty food, strengthening heart function, lowering blood lipids, and dilating blood vessels to promote blood circulation and anti skin tumor activities. They do come in tablet forms too. KY did mention that he found a coffee shop in Penang selling this beverage. In fact, I had taken this beverage at another place – Claypot Restaurant at Hillside, Tanjung Bungah, Penang. Unfortunately, we could not get hold of fresh hawthorn berries in Malaysia. The best alternative would be the dried Chinese hawthorn slices. China is one of the largest producers of dried hawthorn berry slices, thus you can see the country producing candies out from the fruits. One main candy that you would see very common in Malaysia would be the hawthorn flakes (Shan Cha Bing -山楂片) which would come in many shapes (round, square and rectangular). Some adventurous bakery would even use these soaked flakes in their baking such as in the making of the Indonesian Layer Cake. 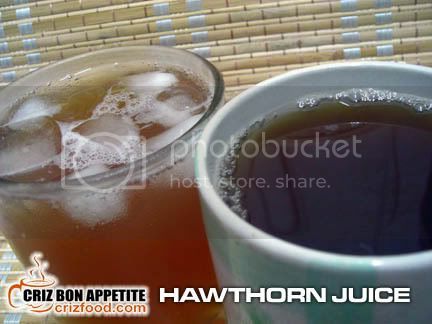 Without more crapping, let me just share with you the simple recipe for the HEALTHY HAWTHORN JUICE. 1. Bring 4L of water to boil. 2. 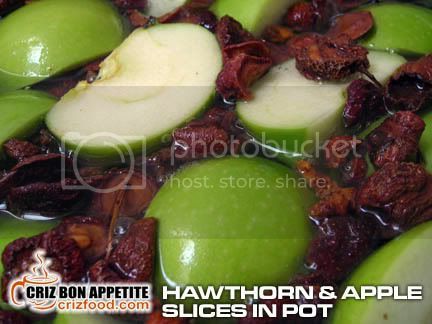 Put in the washed Chinese hawthorn and green apple slices. Lower heat to medium and boil for 15 minutes. 3. Set the fire to low and add in the dried orange peel (I had added this in for the extra tangy flavor) and rock sugar. Let it brew for another 45 minutes. 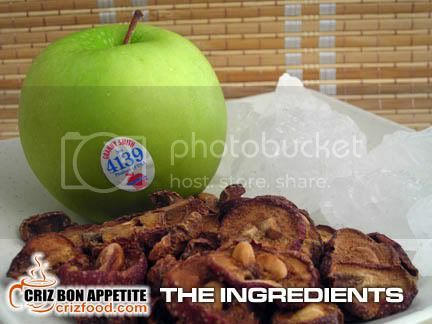 Stir a few times in the process while mashing the green apples. 4. Sieve the juice and leave to cool. You would get about 3L left. 5. Serve chilled, iced or hot. 6. You can stir in some honey if you like it sweeter or sprinkle some grounded ginger or cinnamon to suit your taste as the juice could still be a bit sour. Wow!! you are really can cook !!! Will this cure coughing? I would love to try this healthy juice especially because it got granny smith in it! Used to have the Shan Cha Bing when I was young. It is like a comfort candy esp when taking medicine or unwell. Meaning Chinese parents trust these flakes for their kids even when they are unwell! Good stuff but not easy to find nowadays. i’ve bought dried san cha before but don’t really know what to do with it so i just boil in hot water to make a tea. Yes, I read about San Cha in TCM book. It is used to improve digest system. Your drinks looks absolutely great for current weather. Hahaha.. i think ur recipe is god-sent to many over-binge floggers out there! sweet? got smell? i’ll try if it does help me loose weight!!! haha .. I drank that already, I find it better when the drink is chilled. Thanks for the drink. Nice. Anyway, I am wondering if the drink will be ok if I change the rock sugar to dong gua tiao? How about add-in red dates will that help on cooling down body temperature? Steven… certain ingredients are used for certain medicinal purposes. You can’t have one drink that will cure all sickness in TCM. This drink is for digesting the meat and fatty food… eg. wash out all the unwanted “fat” in the body. Sweetened Dong Gua (甜冬瓜條 – winter melon) has very “inner cooling” effect. You won’t want to visit the “T” more than you require. Haha! Although red dates compliment with many other herbs. It would not be suitable for this combination as it has the opposite properties. Red dates are use to to invigorate the spleen and stomach. They are normally indicated for those with poor appetite, fatigue and loose stools. I hope this will clear your doubt on why I do not combine certain fruits or herbs in my cooking. 🙂 Maybe you would like to know some other combination that would help clear the “inner heat” of the body. Wah… it’s like writing an essay, anyway now I really know that hawthorn is not meant to be together with red dates. I’ve heard of how effective hawthorn is but couldn’t get hold of the recipe. thanks for that! You mentioned that we’d have to “regulate the amount taken per week” so could you let me know how often we can drink this? It work wonders for digestion! Hi Derek… Unfortunately, you can only purchase those dried ones.